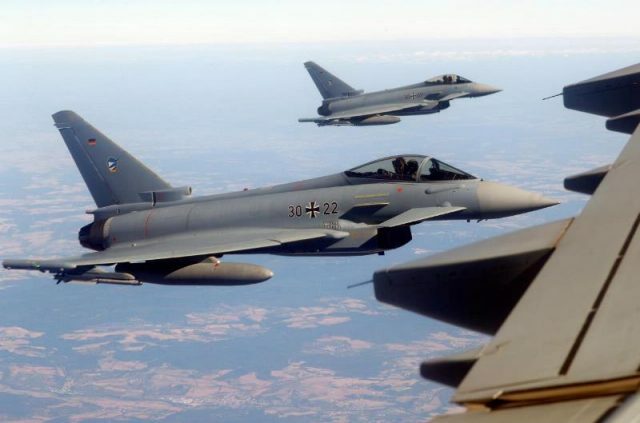 British, French and German fighter jets simulated flight interceptions over Western Europe on Wednesday as part of NATO drills to deter Russian planes from entering allied airspace and to showcase European efforts to integrate their air defenses. Around 60 NATO jets, mainly from European allies, are on alert to defend alliance airspace, as NATO deals with a dramatic increase in Russian air activity on its borders since Moscow’s annexation of Crimea in 2014, with a record 870 interceptions in the Baltics alone in 2016. European allies hope such displays highlight how their air forces are defending Europe in the face of sharp criticism from US President Donald Trump, who at a summit in July railed against Europeans for not spending enough on defense and ports. Two US jets escorted two Russian bombers over the Arctic Ocean on Sept. 7 in the latest incident, while Russia has scrambled fighter jets to intercept nuclear-capable US bombers in interceptions that have echoes of the Cold War.